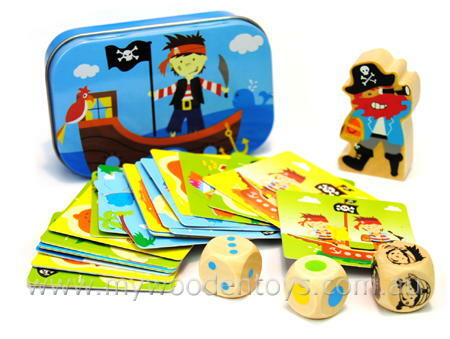 Mini Pocket Tin Box Pirate Game is an entertaining take anywhere game all contained in a little coloured tin box. This little game is for two to five players and contains twenty seven coloured cardboard cards, three wooden dice, a wooden peg leg pirate captain and rule booklet. The youngest rolls first. Depending on what the three dice show the players try to grab the corresponding cards. If one of the dice shows the captain then the wooden captain is grabbed. A game of observation and speed the winner is the first to collect five cards. Material: Tin, Wooden Dice and Pirate, Cardboard cards. We like this because: "Great game very good value for money. "